High-quality and sturdy greenhouse with roof window, consistingof anodized aluminium profiles and heat-insulting hollow chamber. The foldable, practical roof windows ensure a perfect aircirculation. The rain gutter directs the rain downwards lateral at thegreenhouse so you might contain it. you can increase it´s stability when facing strong wind conditions. Additionally safety is given even during extreme weatherconditions and snow load thanks to additional struts in the wall androof area. The base made of galvanised steel ensures additional stability foryour greenhouse as well as the best way to anchor it into the ground. In addition it prevents sinking of the greenhouse on soft underground. Installation: The frame is fixed at the bottom with metalhooks. 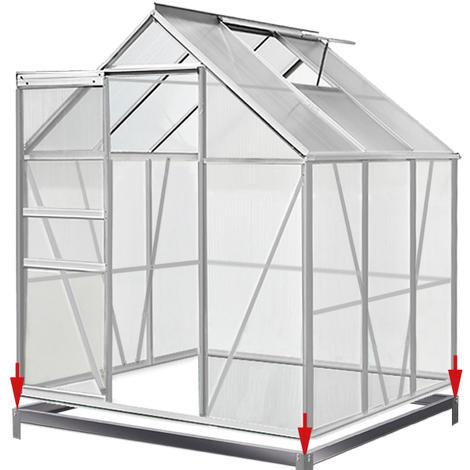 The greenhouse and the frame are tightly being connected withbracket and screws.